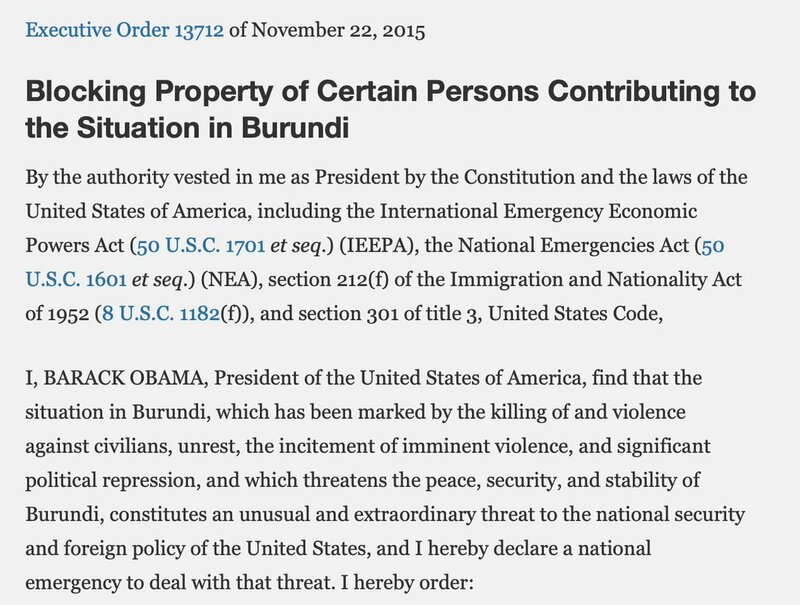 In 2015 Obama declared a National Emergency relating to civil strife in Burundi. 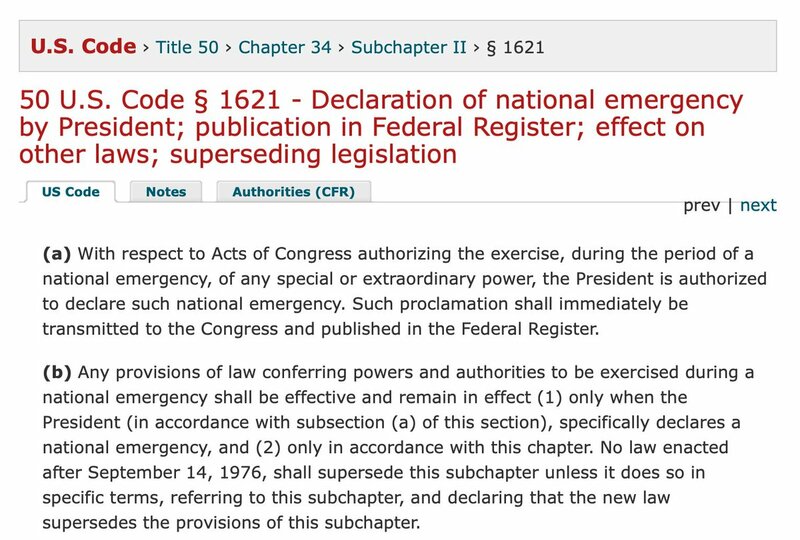 Notice he cites other statutory provisions - those are the ones that lay out the *specific* emergency powers he'll be using. 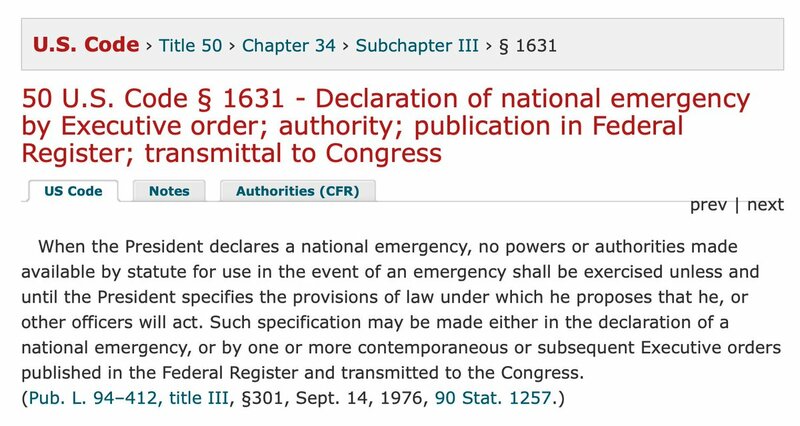 A common question - "OK, so let's say President Trump declares a National Emergency. Can't Congress stop him?" Not really. 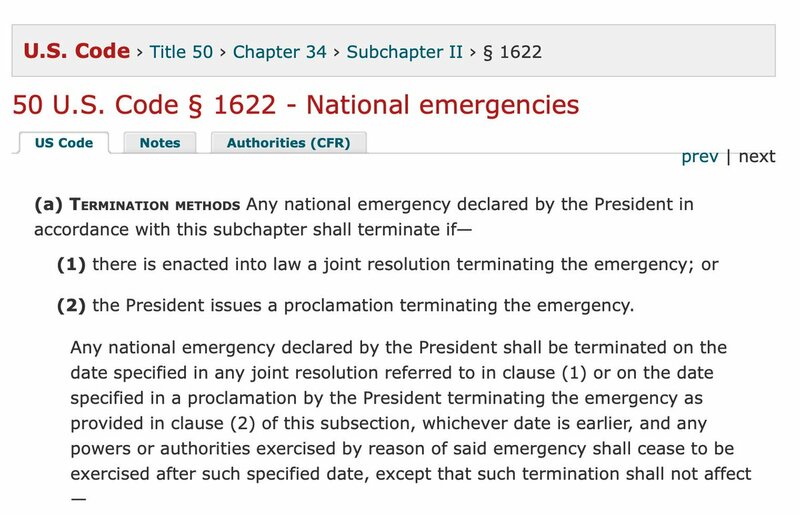 Two ways that a National Emergency can be terminated. Now, let's look at the specific statutes available to allocate funding/personnel to wall construction. First, the gem, 33 USC § 2393(a). It gives the Secretary of Defense two basic powers when a national emergency is declared. First, it grants the authority to terminate or defer any Department of the Army civil works project that the Secretary deems "not essential to the national defense." 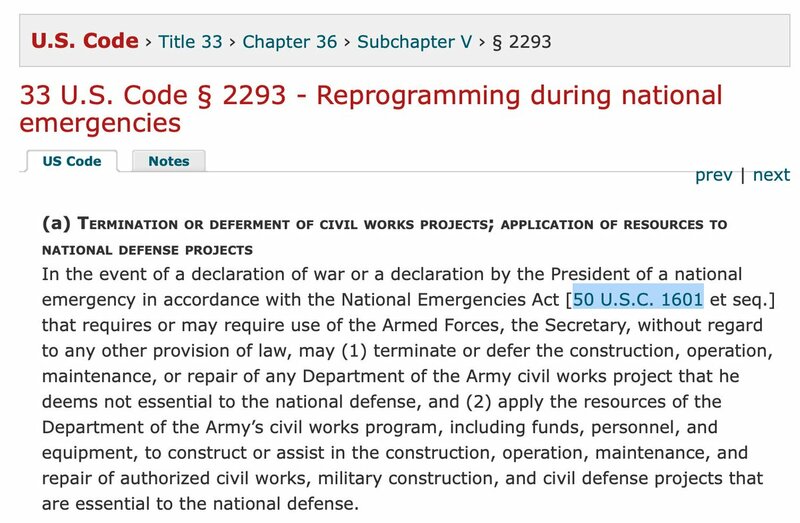 "to construct or assist in the construction, operation, maintenance, and repair of authorized civil works...essential to the national defense." 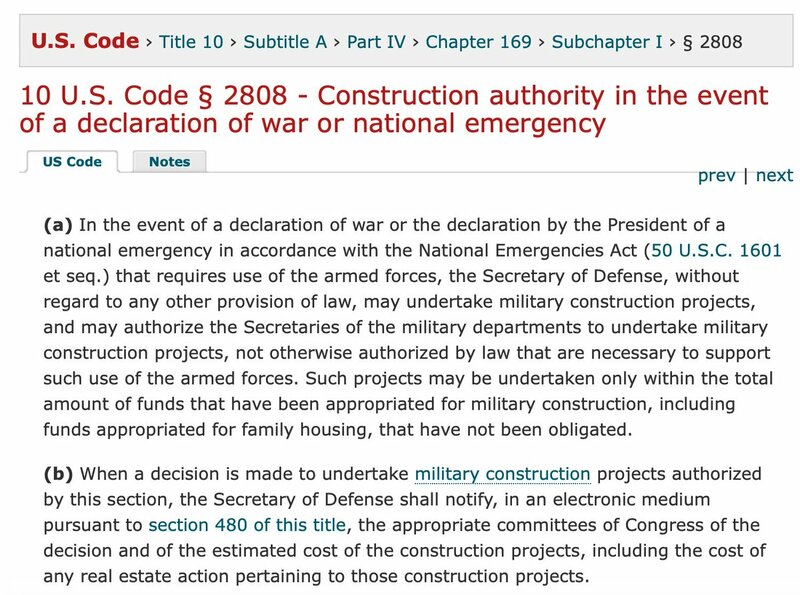 Also available is 10 USC § 2808, which creates a similar mechanism for "military construction projects." This is more of a stretch, as it's not clear the wall would qualify as a "military construction" project - given that DHS currently is in charge. So, to sum up what we've established so far. 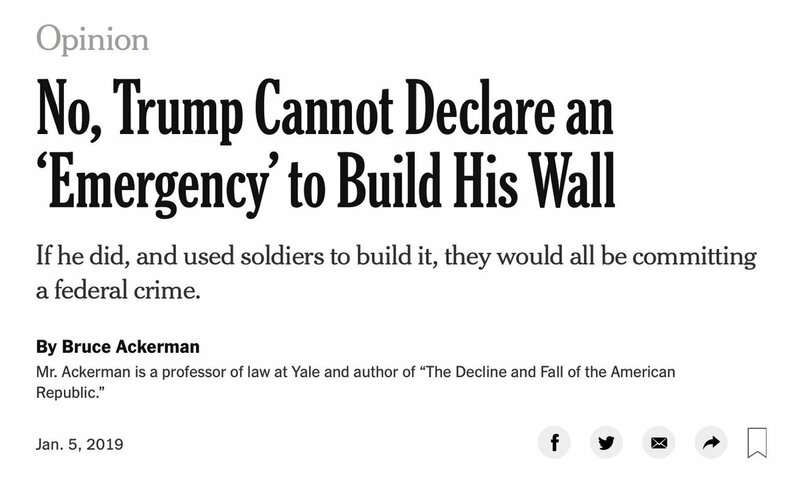 Reading this, you might wonder why an esteemed Yale professor, Bruce Ackerman, wrote an article suggesting that Trump couldn't do this and suggesting that any military forces who participated would be committing a federal crime. 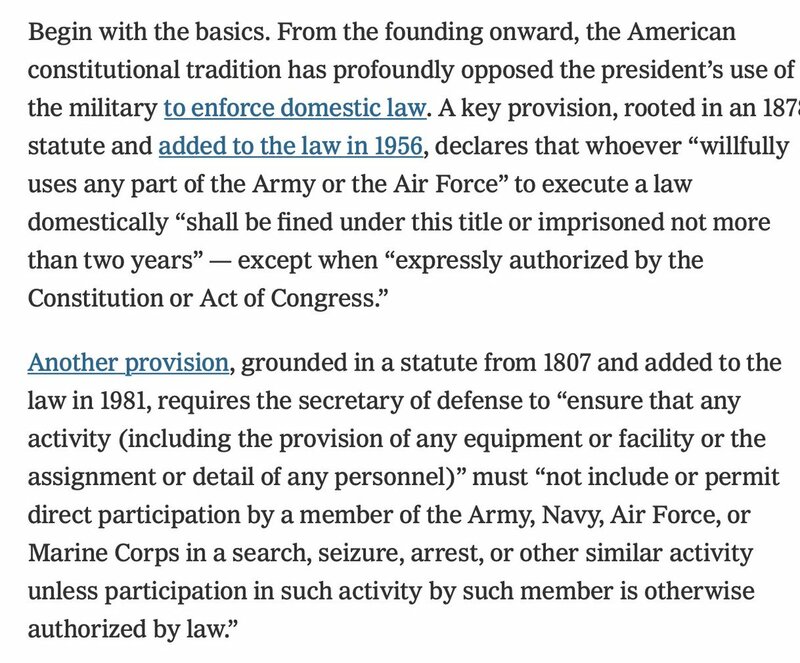 He cites older statutes that prohibit the use of the Military to execute a law domestically - except when "expressly authorized by an Act of Congress"
It's a good thing there are statutory provisions like 33 USC § 2293 to assuage the Professor's concerns! 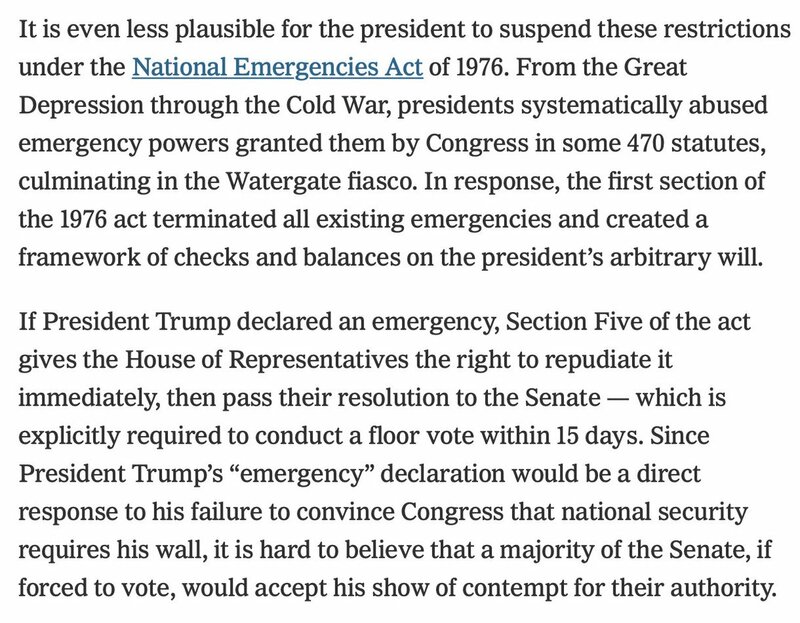 Professor Ackerman suggests that if Trump were to invoke the National Emergencies Act, both houses of Congress could repudiate it immediately with simple majority votes. This is wrong. The statute requires a joint resolution - which would have to get past a Trump veto. Professor Ackerman rightly cites Youngstown (the Steel Seizure cases) as the relevant authority for discussing the limits of executive power. In this case, however, President Trump would be acting pursuant to statute, which would mean his "authority is at its maximum." "The decision to pull out of Syria...was a precipitating event for my going on this record." "Where we agree, we'll work together, where we disagree, we won't." French hates Twitter, but understands that he has to use it in order to remain influential. 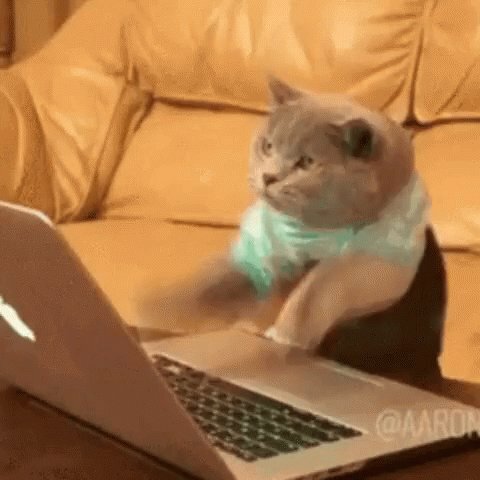 I love Twitter precisely because it has democratized political commentary and influence. There are still gatekeeping mechanisms - the blue checkmark, and the hurdle of getting enough followers/friends to ensure your tweets aren't just shouted into the aether. But once you get over that hurdle, it's game on - and it's a meritocracy. 20 years ago, if you wanted political influence, you needed to persuade someone like Rich Lowry or Bill Kristol to publish you. Once you had that, you were golden. But if the gatekeepers kept you out, you were SOL. 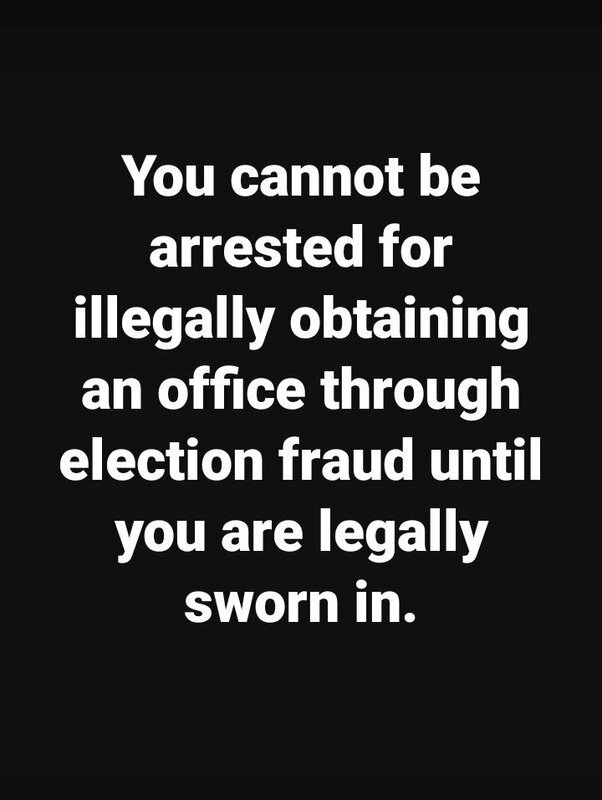 If Trump is even half as corrupt as he appears to be does anyone really believe he will allow himself to be impeached let alone indicted and sent to prison? No, never. The question then becomes: what won't a man like Trump do to save himself and avoid prosecution? Trump has cut ties with traditional allies and cozied up to dictators and oligarchs,the very men who helped him win in 2016 and are poised to do it again, so With a blue wave closing in,there are only two options left: either rrig the midterms or put a stop them.